“In one way, our lives really are like movies,” Stephen King writes in the opening line of his new book, the electrifying slow-burner, Revival. There are main characters, secondary characters, extras, and sometimes, a fifth business, a term that King explains as a significant character outside of the usual framework. The first chunk of the book stays in this time period and it’s warm, comfortable, and altogether very lovely. As we already saw in 11/22/63, King writes the 60s exceedingly well, and when a tragedy tears Jacobs out of Jamie’s life and we jump forward to Jamie’s adult life, I found myself wishing we could stay in the past. But time presses on, and Jamie grows up before our eyes. All the while, Jacobs makes brief, increasingly unsettling appearances in the story. While he isn’t around much, there’s always the sense that he’s up to something big. It’s a little frustrating to feel like the action is happening somewhere else, but King writes Jamie’s life so well that it’s transfixing enough on its own. There’s a magnificent moment near the start of the final third of the book where everything suddenly comes into focus. Jamie, now 56, talks about a bit of old folklore that he remembers. It’s the one about boiling a frog in a pot by making the water hotter little by little, so the frog never realizes that it’s boiling until it’s too late. “I don’t know if it’s true or not,” Jamie says. “But I decided it was an excellent metaphor for growing old.” It’s a sobering moment, because like Jamie, I didn’t notice how much time had passed either. It’s cliché to say that life happens in the blink of an eye, but god, it’s true, and Revival does a better job of capturing that realization than just about any piece of work I’ve ever encountered. There are plenty of moments in the book like this one. Moments that transcend the story and hit you so hard with their real life relevance that they leave you breathless. Here’s another bit I really liked: “That’s how you know you’re home, I think, no matter how far you’ve gone from it or how long you’ve been in some other place. Home is where they want you to stay longer.” It’s the kind of thing you don’t realize until someone says it. King has a real way of sneaking up on his readers like that. One minute you’re cruising, happy enough to follow this fictional character’s struggles, and the next you’re taking a hard look at your own life. If there’s anything that King consistently struggles with, it’s endings, and this one’s no exception. It’s weird and sudden, lurching in a way that the rest of the book never is. The ending, which simply doesn’t mesh well with the rest of the book, comes quickly and suddenly, with hardly the time to catch your breath. In a book that feels more like Stand By Me or Joyland in its coming-of-age nature, throwing out an ending that could have fit right in with the scarier scenes in It just doesn’t work. The conclusion of this book is, admittedly, a pretty scary one (though certainly not the scariest King’s ever written as it’s being billed), but it takes some thought. The repercussions of the finale spooked me more than the frightful scene itself. 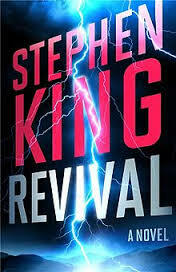 Overall, Revival is a strong book. Is it one of King’s best? Not exactly. Parts of Revival (basically everything that happens during Jamie’s childhood) could be included in a conversation about just how good King really is at capturing life as it truly is, but the ending throws things too far into left field. Still, King is a masterful writer, and even his flawed books stand above others. I would recommend Revival to anyone, but I would include a nudging warning not to focus on Jamie’s destination so much as the journey it takes to get him there. Because this blog is about television and film, you know I have to throw a bit of film talk your way. So, let’s talk briefly about adaptations. There’s little doubt that someone is going to want to adapt this book for the screen. It’s a lovely tale with explosive imagery. King’s writing propels this one straight off the page. The question is, should this be adapted? And if yes, what medium would best suit this story? A simple answer to whether this book should be adapted for the screen is… yes, of course. I’m dying to see this come to life visually, and the story is one that lends itself to a sharp adaptation. My recommendation would be to adapt this as a movie, rather than a television show. The story, while it runs the course of Jamie’s entire life, is a relatively small one. Jamie’s world is fairly limited, and there just isn’t enough material in Revival to sustain a TV show. There is, however, plenty of great material for a movie. This wouldn’t be an easy adaptation. Filled with time lapses and big special effects, it would take the right team to pull it off, but I think it could be done, and I’d like to see it. Follow me on Twitter @SkyyTweet!